But this is a dish I’ve put together using a few different recipes, and it’s starting to be my go-to dish for when company comes over, even though there’s a lot of slicing and dicing involved. But the best thing is that you can scale that part down, and throwing the pork in the slow cooker is just so easy. And if you do eat meat and haven’t tried putting pork belly in your slow cooker yet, you’re in for a nice surprise. It’s delicious! The only problem is that you might find yourself thinking, “Do we really need to have company tonight? There doesn’t really look like enough for four…maybe we should cancel…” with the little voice on your shoulder saying “Eat it yourself! Tell them you’re virulently ill! Close the shades! The neighbors will never know why you canceled on them!” Thankfully we didn’t, because it was a very fun night with Steve, Sara and their fun little terrors—I mean “boys”—Ben and Zach. We’ve never had someone strip at the table before, so thanks, Zach, for that first! But it’s too good not to share, and since guests keep raving about it, I’m going to keep cooking it. And a great side note: Don’t throw out the cooking liquid from the pork. It turns into a wonderful broth for a pho-style soup! You can just freeze it like any other stock and keep it until that chilly day comes up that’s just calling for some warming soup. 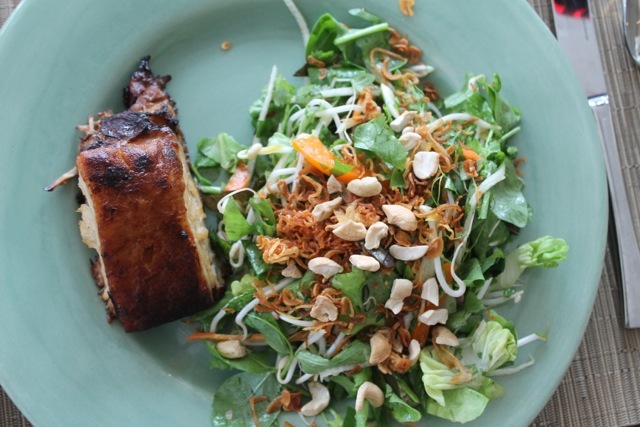 Vegetarians and vegans can sub some delicious, soy-marinated tofu or tempeh for the pork and use a replacement for the fish sauce in the dressing (here’s a great recipe for “Not Fish Sauce”) and this will still be a crowd-pleasing, knock-out dish. Place everything in the slow cooker, and cook on high for 4-6 hours. Just before service, cut the cooked pork belly into portions, then place on a cookie sheet. Place under the broiler and watch carefully. 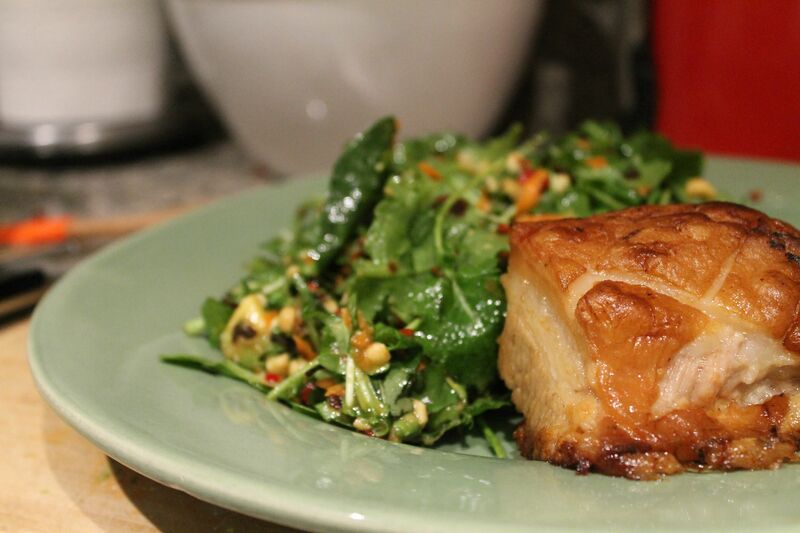 You basically want to crisp up the fat on the top of the pork belly. Don’t let it burn! 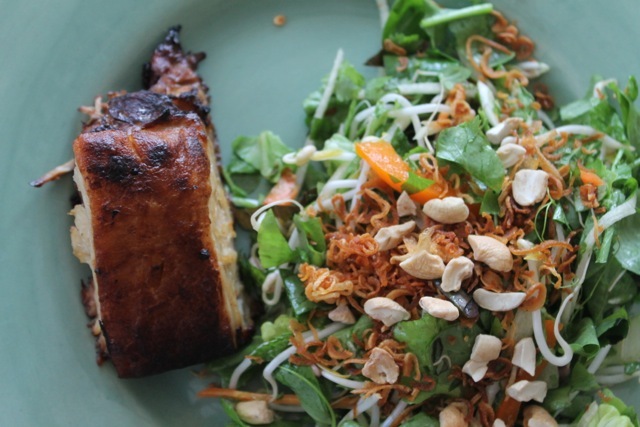 Serve immediately on top of the salad, topped with toasted, chopped cashew nuts and crispy shallots. ++You can make this salad as big as you like, and add/subtract as many of these ingredients as you like. I put them all in, but it’s your choice! ++Double this if you are making a big salad for four or more people. Mix together and let sit for about 30 minutes before serving. Keeps well for about one week in the fridge. Take about a half-pound of large shallots and slice them carefully on the thinnest setting of a mandoline. Heat up coconut oil or another oil that’s good for high temperature cooking (PLEASE never never use canola oil!) and deep fry the shallots, in batches. Watch these carefully, as you think nothing’s happening for about 5-10 minutes, then BAM! They’re getting all brown and crispy in seconds flat. Scoop out with a slotted spoon or strainer spoon onto paper towels. Let cool and sprinkle over salad. 1. I hope so–he’s already a riot. He’s 2 1/2 and like a little drunk person. He mumbles, does somersaults on our lawn and drinks out of bottles. He’s like half of my friends! I’ll ask his mom for you. This looks so tasty! 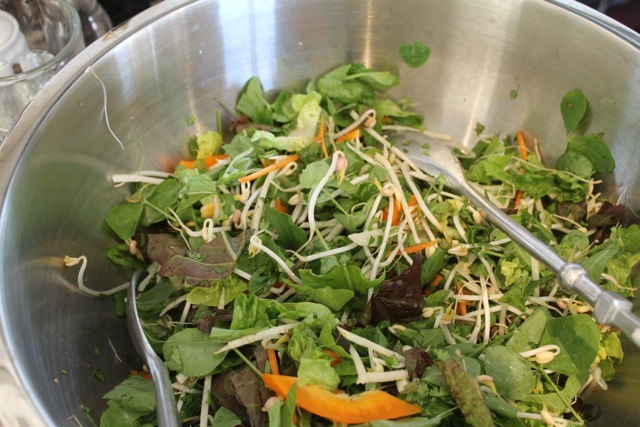 I really like the salad and the dressing – I’d love to have it for dinner. I hope you try it! It’s so refreshing and crunchy. The flavors are tangy! I love slow braised anything, but pork belly with a delicious Pho style broth!?! It will certainly win out in the end! How wonderful that you do enjoy these moments in life, good food, great company and pleasant memories is one of the truest luxuries in this world! Enjoy every bite!!! Thank you! I agree on all counts! Happy first day of Fall. This is a perfect dish for the season. Some thing warm and comforting that can cook while you are out doing garden chores and then paired with a salad with bounty from the garden. Very nice! 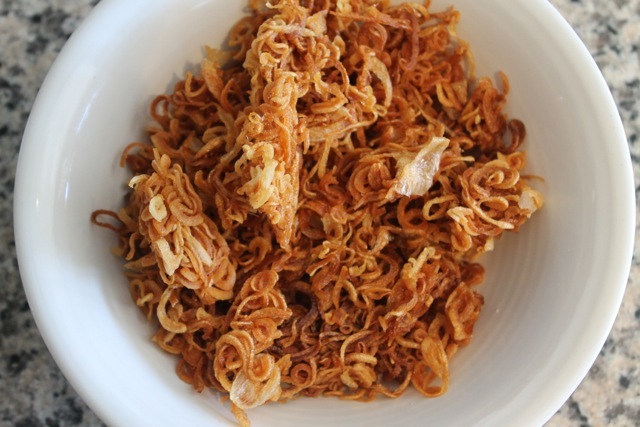 I love your crispy shallots. As a topping they make everything taste better. But alas, mine don’t always crisp so well! Yum! I’ve returned to Whole Foods now 3 days in a row for their pre-made pork belly. Can’t wait to try it on my own. Thanks for the follow! And this recipe couldn’t be any easier thanks to the crock pot. And you could probably tweak the ingredients if you didn’t want it quite so Asian-flavored. But I like it that way so I can have the pho broth afterwards. 🙂 I’m glad you’re going to try it yourself–I’m here if you have any questions! Do you use pork belly with skin on? I can’t always get it with skin on, but I’ll use it if I can find it. That gives the crispiest result, although you may need to cook it under the grill a bit longer. Let me know if you have other questions! I am cooking a pork belly right now. I didn’t have star anise, so I used a little 5 spice, and no chicken broth, so I put the bones from 2 chickens in with it to make broth as it cooks. The house smells heavenly already! You’re making me hungry! Nicely done on the improvisations too. I’m sure it will taste even better than it smells. Happy eating!